Hello there! 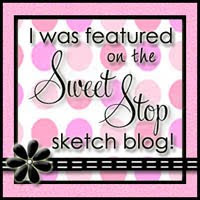 Did you enjoy seeing all the projects for the MFT June release? 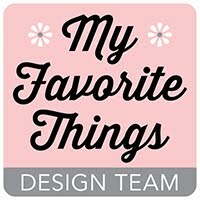 All of the new products are available in the MFT Boutique right now and the design team is having a little June release rewind party again tonight. 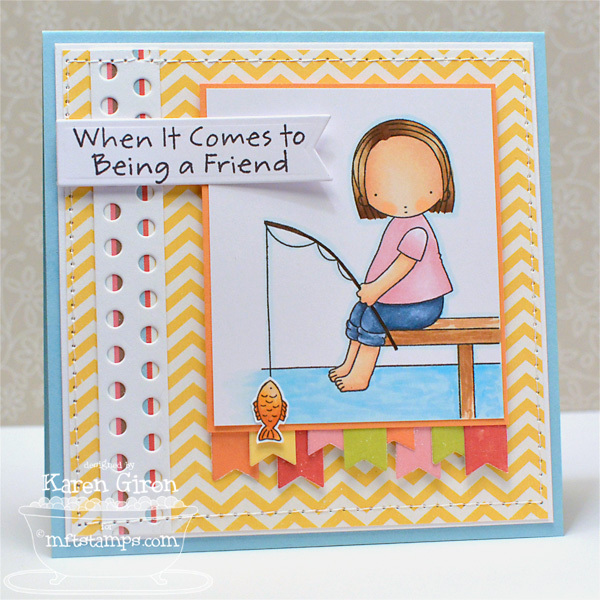 I have a couple of cards for you today - my first card uses Pure Innocence Gone Fishin'. I started by stamping her with Memento Tuxedo Black ink on X-Press It Blending Card Stock and then colored her with Copic markers. 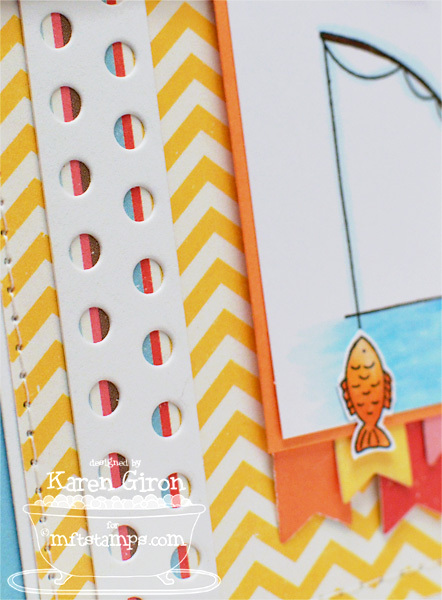 I used the new Peek-a-Boo Dots Die-namics for the vertical strip and added some patterned paper underneath. 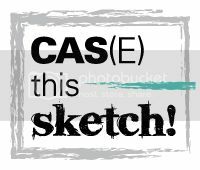 Along the bottom of the image, I added lots and lots of Fishtail Flags Layers STAX Die-namics for some banner yumminess. The layout is FMS89. I stamped the rest of the sentiment inside the card in Black Licorice Ink. My next card is a pretty clean & simple card. 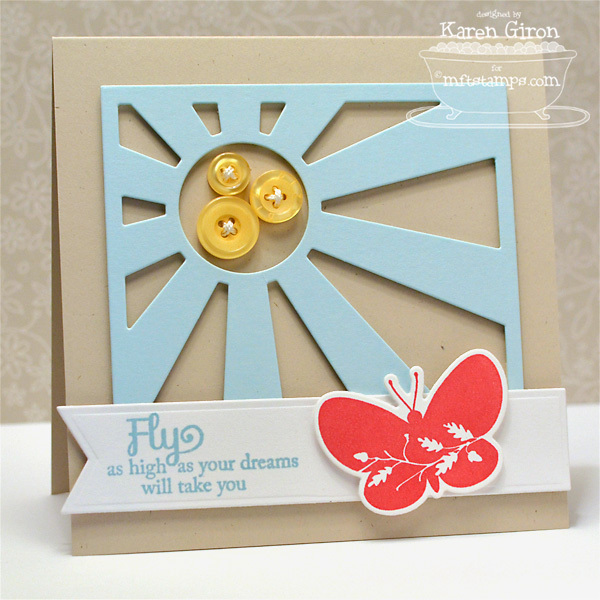 I used LJD Blissful Butterflies stamps and coordinating LJD Blissful Butterflies Die-namics. I stamped the butterfly in Electric Red Ink on Smooth White Card stock and the popped it up over a Fishtail Flags STAX Die-namics banner. 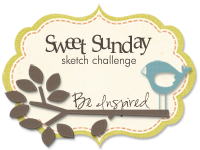 I stamped the sentiment in Berrylicious Ink. The sun element is made from the Sun Ray Die-namics and then I added 3 Lemon Drop Buttons in the center. 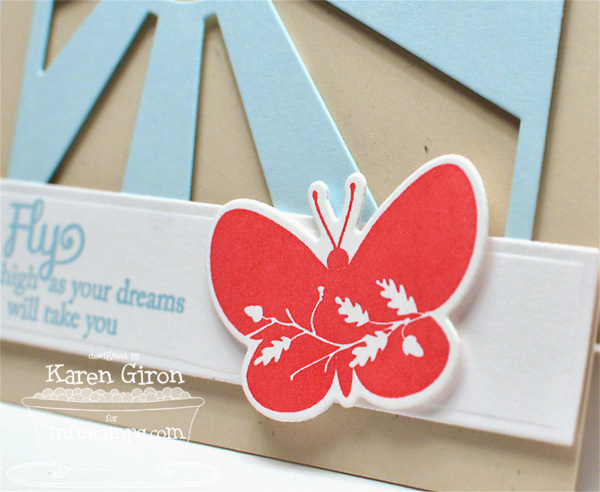 I used another butterfly from the set for the inside of my card and stamped the sentiment in Kraft Ink. 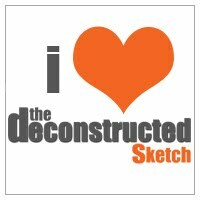 Be sure to stop by the MFT Blog for a complete list of all the designers playing along in today's Release Rewind. Such cute cards Karen! 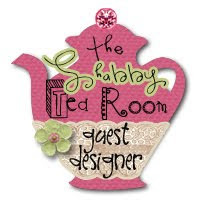 Love the fun and cheerful color combinations! 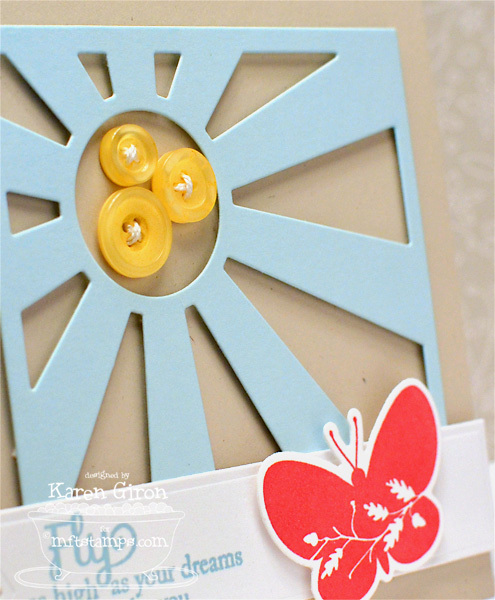 What a cute sun and butterfly card! And the PI card is adorable. I have such a wish list of product that I'd like from this release!!! BEAUTIFUL, Karen! loooove all those flags on the PI card and the Sun Ray card is awesome!!! so cool how you made it work on the square card. Your cards are ADORABLE. I love the hanging fish on the first card and the buttons in the sun is so clever. PRETTY! Two stinkin' ADORABLE cards, Karen!! 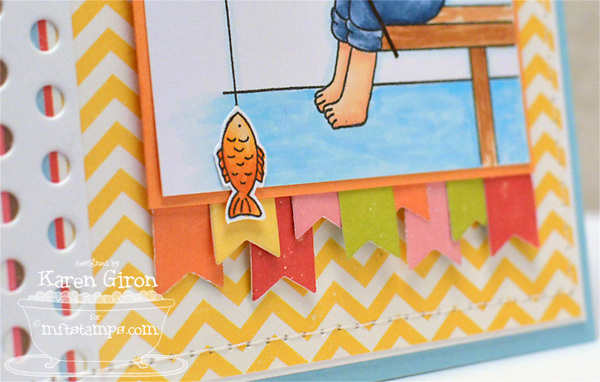 I love how your fish is hanging out of the frame and Sun Ray card is GORGEOUS!! 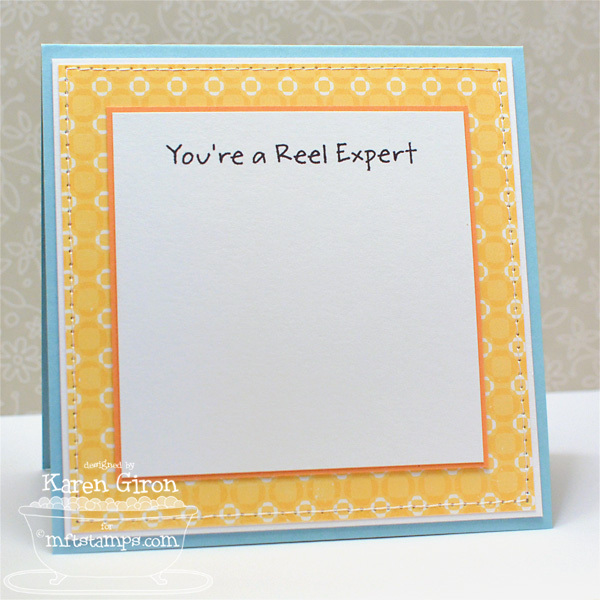 Cute, cute cards Karen! Love how the fish hangs and great layouts! Both of these are bright and sunny....and just plain fabulous! These are fantastic, Karen!! Love the fishin' card!! Such happy colors! And those buttons for the sun are adorable! SHUT the front door! You are a rock star my friend! LOVE your first card with your gorgeous coloring and all the little banners, but the sun ray and the buttons...sigh. Absolutely FABULOUS! Love those sunny buttons inside the Sun Ray and your gaggle of fishtails are just the perfect touch, Karen!